Join CoRe and Mediate BC at the Vancouver Fringe Festival! Thanks to Pinterest.com, a not-so-recent blog post in Cute Food For Kids has been making the rounds. Back in October, Vancouver mom and blogger Tiffany 楊茜茹 showed “How to Draw on a Banana.” Thanks to the amazing connectedness of everything on the internet, Tiffany’s blog for a very specific audience was picked up first by the slightly more broadly aimed Come Together Kids craft blog, and from there by the much more mainstream and widely read The Bloggess. And suddenly banana writing is everywhere! And hence the inspiration to consider its application to mediation. Banana writing is simple: take a banana, lightly scratch your words (or a picture) onto it with a toothpick or similar sharp object, and allow the letters to darken. Over the course of an hour or two (depending on the initial ripeness of the banana), the letters will become more and more visible. 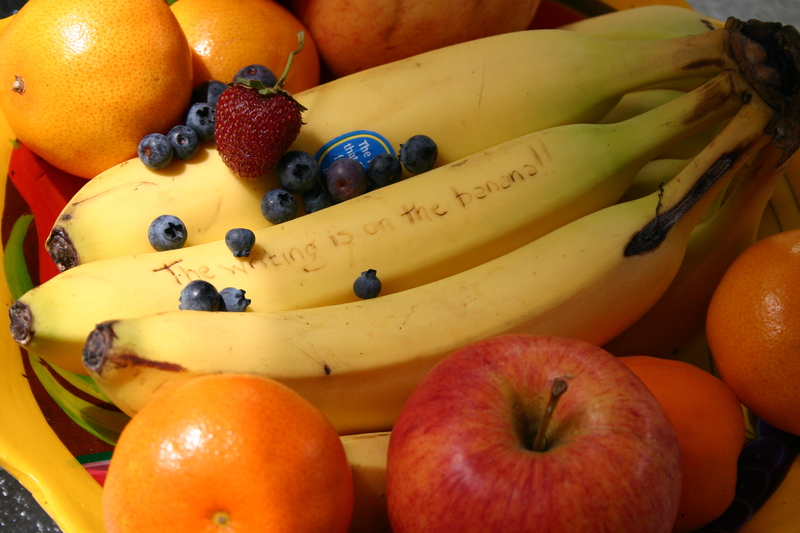 You can cover bananas in a fruit bowl so that the words emerge suddenly, or leave them out on the table to see who spots the emerging words first. Or write only on the underneath layer of a bunch of bananas, so that the words are seen only as time goes on and bananas are consumed. However the writing appears, it’s a quick pattern interrupt! and a chance to refocus a discussion on problem solving. 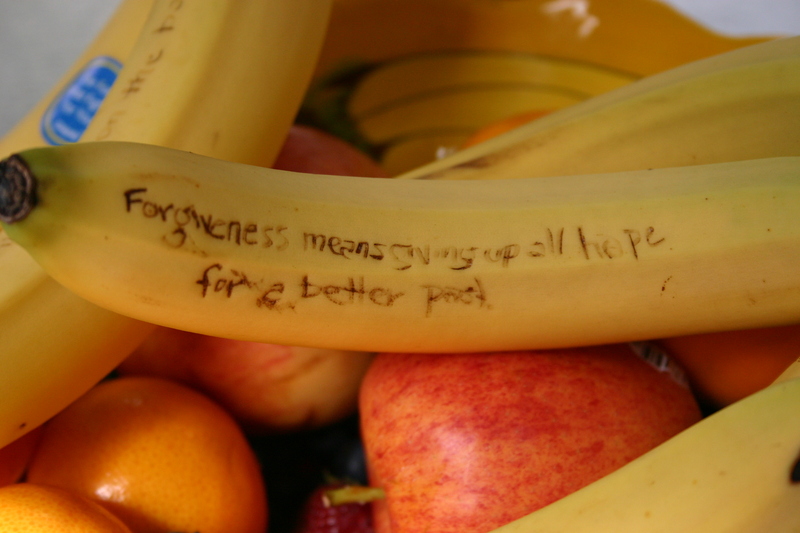 I imagine a variety of approaches to banana writing in mediations. Here are a few ideas for how and where to introduce a little banana jolt. The commercial mediation has been dragging on all morning, and it’s clear that parties will be taking a quick working lunch together at the table. As a mediator who is comfortable evaluating but has a preference for solutions arising from the parties themselves, you take a quick break to come up with a number of possible approaches to resolution and to jot them on the bananas that will sit on the table as dessert. Keeping with the triggering notion of idea generation through social media, it so happens that another facebook friend chose to post a series of links to music that have been formative for her musically and ideologically. Given that she was born in the early 60s, it will not be too surprising that she has posted a number of peace songs. So, you’re mediating a family dispute between baby boomers; maybe your bananas have some catchy 60s and 70s folk song lyrics on them? The parties both are infected by “ear worms” that keep lyrics like “Imagine all the people, living life in peace…” or “A time for love, a time for hate. A time for peace, I swear it’s not too late” running through everyone’s head as they discuss parenting plans. Of course, music can be very generational, and tastes vary considerably. My favourite artists all have great advice about negotiation in their lyrics, but my personal mission to expand the fan bases of Todd Snider and Marian Call might be more effectively accomplished by playing the music than by including their lyrics on bananas. In other words, you do need to think about your audience – as always. The idea of having conflict resolution quotes visible during a mediation, perhaps only as a subliminal message on the pens or notepaper that the mediator hands out, becomes much more overt when the quote appears mysteriously on food! Check out John Ford’s Conflict Management Quotes as a great place to start the search for ideas. I liked the Lily Tomlin quote below. It requires a bit of thinking, and might just lead to conversation; especially if you’re as unpracticed in your banana writing as I am, and you need to help with the reading. And let us not forget that banana writing might simply be funny. 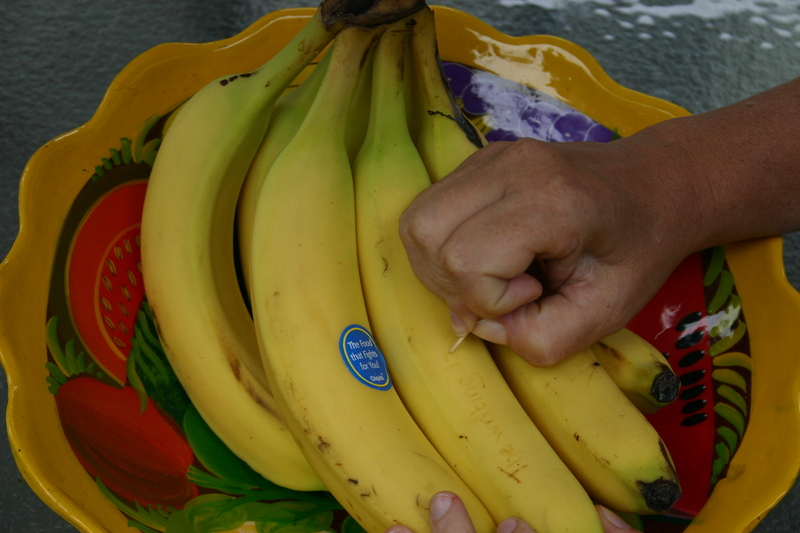 The Bloggess speculates on the best phrases to carve into supermarket bananas to startle unsuspecting shoppers. While I don’t see myself writing “Act natural. You’ll be contacted soon.” on a mediation banana, I can imagine quite a few things that would strike me as funny if I were a party, and would help me to break out of a pattern of frustrating deadlocks. What about a quote from television mediator Kate Reed of Fairly Legal? And I’m sure there’s a great banana split joke to be made! Do add your own ideas as comments below!